The concept of “One Water” gains traction in Colorado with regulatory updates and innovative design. In most households and businesses, every drop of clean, incoming water has just one job to do. That task might be to wash clothes, fill a drinking glass, bathe a human or flush a toilet—but once its job is done, water has historically shared the same fate: It’s swirled down the drain to a wastewater treatment plant and released back into nature. Then the cycle of collecting water begins again. Yet water is scarcer than ever, thanks to climate change and growing human populations. So across Colorado and nationwide, communities are developing systems for recycling their wastewater. While municipal and larger regional water reuse systems are increasingly common in Colorado, not everyone is located near them. Even within municipalities where water is reused through a large centralized system, some big water users want to take the next step toward sustainability—by conducting their own localized water treatment and recycling efforts, on site. Rural homes have long used septic systems, the most common form of on-site wastewater management. But since the 1980s, particularly in the eastern United States, a growing number of homes, neighborhoods, housing developments, office and school campuses, and communities have also installed localized water treatment systems that let residents use their own recycled wastewater for irrigation, toilet-flushing, and other non-potable uses. 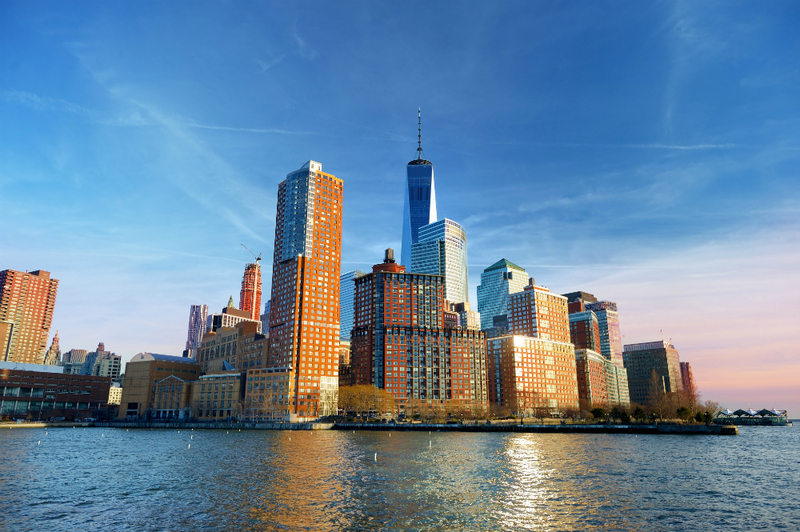 New York’s 92-acre Battery Park City redevelopment uses wastewater and rainwater recycling systems in six of its buildings. There, localized reuse demonstrates sustainable urban development—a goal driven by the city’s ambitions—with reuse improving water quality by reducing the amount of discharged wastewater and the quantity of water supply needed. The water is then reused for flushing toilets, cooling, laundry, and garden irrigation. And at Gillette Stadium, home of the New England Patriots in Foxborough, Mass., a localized system was developed because the town couldn’t otherwise supply the water needed for the stadium, nor could it readily address wastewater discharge requirements. The solution: Water used by fans at the stadium is captured, cleaned through a membrane bioreactor treatment plant, and reused for toilets, cooling, and other on-site purposes. Colorado, while new to on-site reuse, is in the process of developing regulations to protect public health, making it easier and safer to implement localized systems in the state. If passed, these new regulations will bring a new level of purpose to the word localized. “Historically, these [localized systems in other states] were treated as wastewater systems and were permitted under whatever small system rules existed,” says Ed Clerico, engineer and CEO emeritus with Natural Systems Utilities, where he has worked on more than 200 localized systems across the country. “Now you’re admitting it’s really a water supply system as much as it is a wastewater system.” Colorado’s current rulemaking—modifying Regulation 84, which will be voted on by the Colorado Water Quality Control Commission in October—marks the first time in the United States that there will be a statewide non-potable water regulation tied to localized systems, Clerico says. Overall demand for new water supplies in Colorado is only likely to increase in the future. The state’s population, now 5.3 million, is expected to nearly double by 2050, and by then, Colorado could come up as much as 163 billion gallons short of its annual water needs, according to Colorado’s Water Plan. Indeed, the specter of water scarcity is driving the call for localized water systems in Colorado and spurring the desire to maximize each drop of water. Such efforts are part of the One Water movement, which promotes an integrated approach to water management. 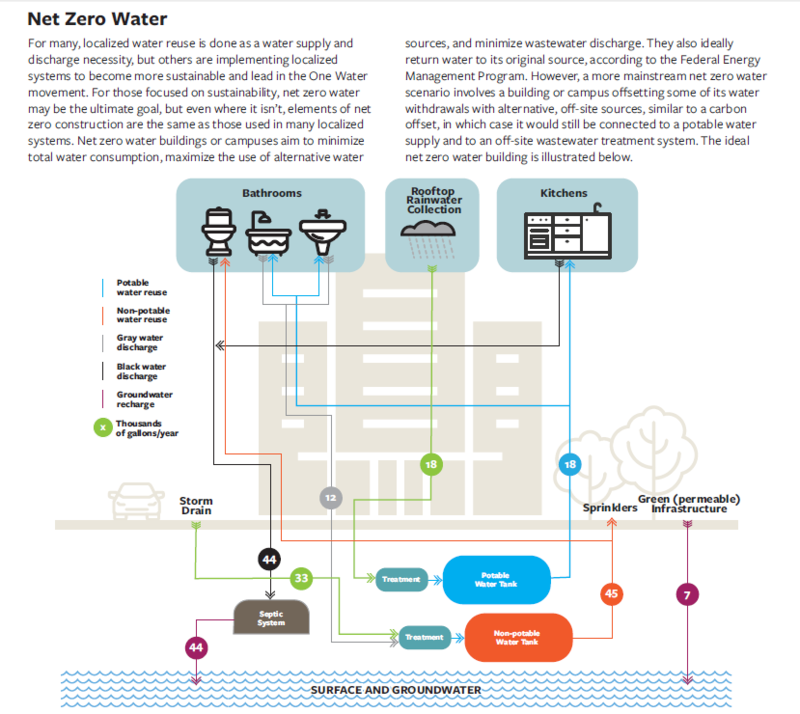 Instead of conducting separate (and siloed) efforts to manage stormwater, wastewater, and drinking water, One Water projects use more holistic systems that treat water differently depending on its intended use. Recycling wastewater—or giving water more than one job to do—plays a key role in such systems. Localized systems often become economically feasible with mid-sized projects, or systems processing less than 500,000 gallons of water per day and more than 10,000-15,000 gallons per day, says Clerico. But the economic feasibility of these projects depends on many factors including the cost of the water supply and wastewater services that you’re offsetting, and, in the case of Gillette Stadium, whether existing centralized infrastructure is available. Both are working factors in the plans for Elbert County’s Independence Community. If approved, each of the 920 homes on the 1,011-acre development will have two water connections: one potable, one non. Wastewater will flow to an on-site recovery facility that will return treated water back to the homes for lawn irrigation. 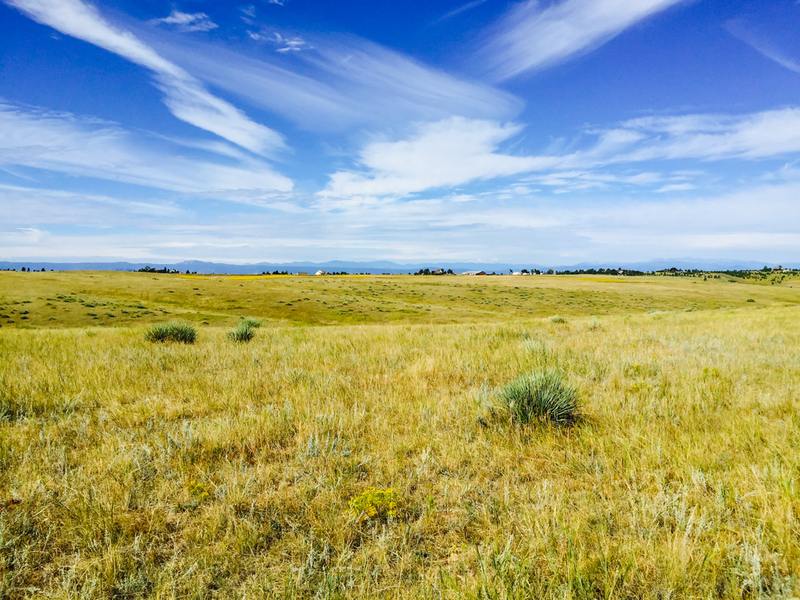 The Independence Community isn’t situated on a naturally renewable water source—furthermore, Elbert County limits the amount that developments can draw from the Denver Basin Aquifer. Using a localized water treatment system is making the development viable where it wouldn’t have been otherwise. The proposed modifications to Regulation 84 include automated data collection and system monitoring to keep localized systems cost effective and safe. If approved, Regulation 84 will no longer apply just to centralized reuse systems but will include localized systems treating water for landscape irrigation, agricultural irrigation, fire protection, toilet flushing, and other industrial and commercial uses—it does not apply to potable water uses. “Direct potable reuse through localized reuse systems has not happened within our market area,” Clerico says. “It’s not something we promote because at this time we can get enough benefit from non-potable systems.” Even so, the use of localized reuse to purify water to drinking quality is feasible, just not yet economically viable, and water isn’t yet scarce enough that it’s necessary, Clerico says. Sun Valley hasn’t yet settled on a design for its localized system, and even at 2506 West Colfax Avenue, which will be the neighborhood’s first, flagship building, architects are still considering a variety of infrastructure options. All require an unfortunate amount of duplication, says Yong Cho, an architect at the Studio Completiva firm that was chosen for the 2506 project. “We’re designing and building to a future potential, but we still have to install systems that are currently legal,” he explains. That means plugging into the city’s municipal water system, even when the building may eventually function “off the grid,” as some structures do with self-supplied energy. “In order to receive our certificate of occupancy and get the building permitted, we are required to tie into the city’s water supply,” says Cho. Under the modified Regulation 84, localized systems must have a backup potable water connection that could supply potable water to all fixtures that were using the non-potable, locally treated supply, in case the reclaimed water becomes unsafe or there isn’t enough of it to supply water throughout the system. “But years from now,” Cho continues, “if the laws change, we could theoretically unplug  from the bigger municipal system.” While state regulations might always require a backup municipal supply of water, Cho envisions cutting ties with city water by using tanks and filtration for rainwater storage and incorporating localized systems to treat wastewater. Throughout the process, Denver Water has been a terrific partner in innovation, says Gabe Bergeron, another Studio Completiva architect. The utility freely shared the data it collected to prepare for the $195 million redevelopment of its own 34.6-acre administrative campus, which incorporates and demonstrates cutting-edge water reuse systems. “They’ve come up with a really interesting tool that architects can use in their design process,” says Bergeron, who is using Denver Water’s tool to study different infrastructure options for his 170,000 square-foot facility combining commercial space with a restaurant, cultural center, and events platform. On Denver Water’s new campus, which it expects to complete by 2020, the water provider plans to combine rainwater capture with localized treatment of wastewater to provide for toilet flushing and landscape irrigation. Denver Water was the main proponent that worked to modify Regulation 84, in part because of its campus redevelopment project, says Damian Higham, a recycled water specialist at Denver Water. “We also want to be leaders in this space in terms of clearing the path for customers,” Higham says. The utility’s campus will feature a learning center where Denver Water can provide resources for localized systems across the country. Between Denver Water’s campus and a new Water Resources Center that’s planned for the redevelopment of the National Western Center, Denver could soon become a mecca for learning about localized reuse. The facility at the National Western Center will combine a water laboratory with sustainability demonstration projects, educational outreach, and a business incubator. And it will allow stakeholders such as Denver Water and Colorado State University to collaborate on next-generation water systems. “As a university, we have the opportunity to research the state-of-the-art in green infrastructure and to advance the conversation about emerging technologies,” says Jocelyn Hittle, CSU’s director of Denver programming. The impact of a system depends on how water is used, Clerico says. If water in a facility is used mostly for non-potable uses, then more water can be reused—so if most of a localized system’s water goes toward toilet flushing, cooling, irrigation, laundry, or other non-potable uses, the localized system will have a greater overall impact in offsetting water use. In some commercial installations, as much as 90 percent of the water can be reused, Clerico says. In residential settings in New York City for example, where recycled water is used for toilet flushing, cooling and irrigation, 45-55 percent of the water is reused. It’s that big-picture long view that truly supports localized water treatment and other innovative systems, says Cho. “Water is going to be the choke point for further growth in this entire region, so I think it’s perfectly reasonable to ask developers, to ask cities for higher-performing buildings,” he says. While there’s a cost to building more sustainably, Cho says, there’s a greater cost and risk associated with ignoring water scarcity.